is an A-3 Sky Warrior. 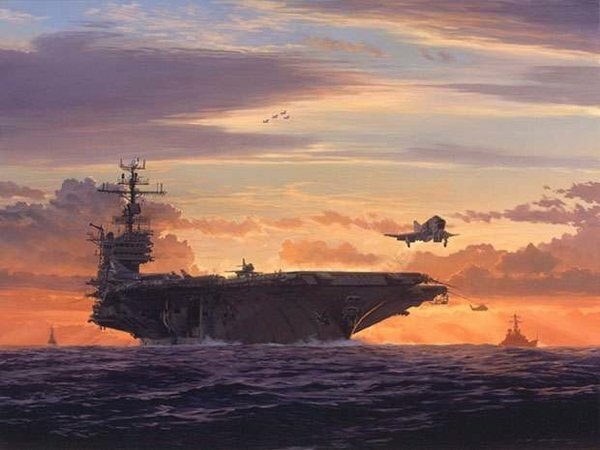 In June, 1968, the aircraft carrier "America" took up position in dangerous waters. Seen here launching an F-4, while an A-4 prepares to launch, the U.S.S. "America" begins her tour of duty off the coast of Vietnam. On her deck are an A-3 Skywarrior (in front of the island) and two RA-5s. A cruiser and a destroyer stand in the background. Above, four A-4s fly in formation while an HC-7 Seasprite helicopter transits between the cruiser and "America." Backlit by the setting sun, the U.S.S. "America" steams into the wind during the launch and recovery of her aircraft. Since January, 1965, "America" has been on a cruise of the east coast, Atlantic and Mediterranean. But now, she will see combat for the first time on station off the coast of Vietnam. "America," the ship and the country she is named for, now move into unknown waters of history. During operations from 1968 to 1972, both ship and country will experience the bravery and tragedy of war. But both will forage ahead into an ever-challenging and changing future.